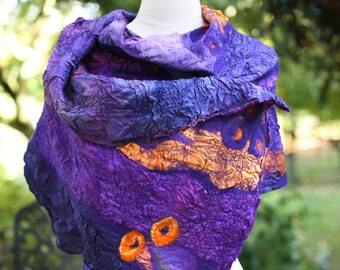 A lovely accessory to dress up an outfit and add a bit of warmth. 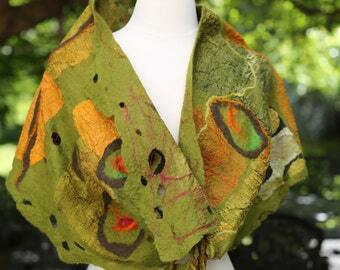 Perfect for cool spring and autumn evenings when worn over a sleeveless outfit or layered on top of warmer clothes to brave the cold with color and style! 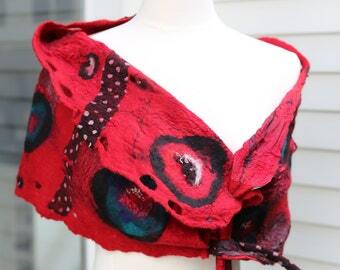 Equally as gorgeous worn inside out! 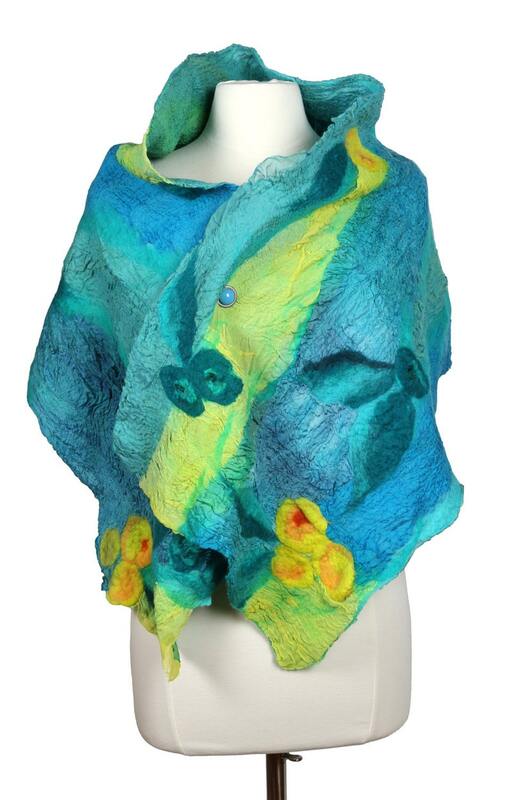 Hand-dyed Habotai silk, silk chiffon, Merino wool and decorative fibers come together in this soft, artistic splash of color. Shawl has decorative 'dreadlocks' and holes that can be used as a closure - simply thread dreadlocks through holes and leave long or tie. 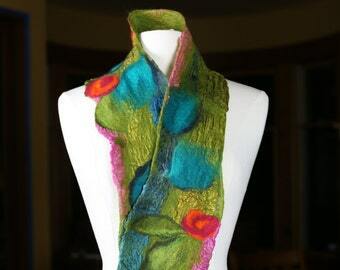 All of my felt pieces are handcrafted by me, in either my Whidbey Island or Kirkland studio, both in Washington State. 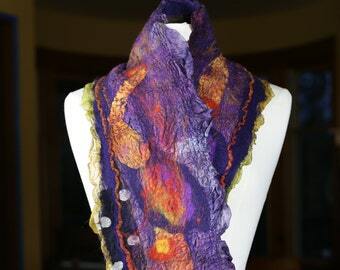 I use a wet-felting technique (soap, water, friction), with top quality wools and silks to create one-of-a-kind artful accents to enhance your wardrobe. Contents: Hand-dyed Habotai silk, silk chiffon, Merino wool and decorative fibers. Cleaning: Wool is naturally resistant to dirt and absorbs water very slowly making it possible to remove many potential stains quickly with a wet cloth (Dab, but don't rub too aggressively). Gently hand wash in lukewarm soapy water if needed - but be sure to avoid any agitation (which may cause shrinkage). Rinse in cool water a number of times until water runs clear. Gently squeeze out excess water (avoid wringing). Roll in a towel to absorb excess water and lay flat on a towel to dry, reshape if necessary with an iron on SILK WOOL setting. 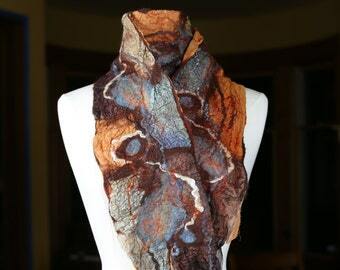 If dried, you can shape by using steam heat when pressing. Note: Colors can appear different on different monitors. 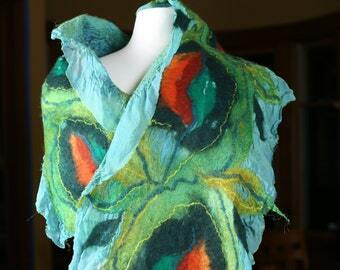 Artful Color in Nuno Felt - a beautiful book providing inspiration and eye candy! Her explanations of color theory are easily understood and her lesson on making any two colors work together is brilliant. 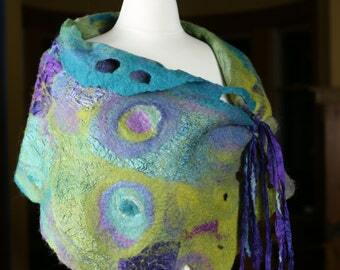 Covers a variety of felting techniques to build upon. A wonderful addition to the library of all felters. Love the book! 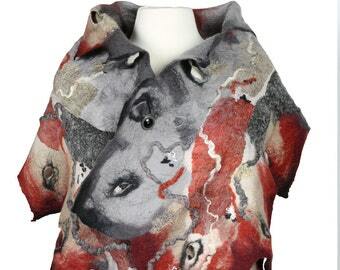 So inspirational with all the beautiful and colorful wearable art and more. 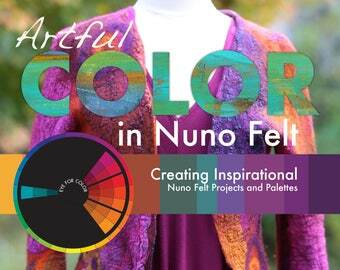 I know I am going to learn alot about color and I’m looking forward to putting my own spin on the projects.Highly recommend this book to all nuno felters and felters! Lovely book with lots of information and instruction, beautifully photographed. An additional bit of niceness is that Beverly signed it and added a personalized note.